Challenge your Senses, inspire Creativity! Being a 'Sensorial Perception Detective', I just couldn't resist on accepting the offer of being part of the coach-team facilitating C2 labs at the IMEX exhibition in Frankfurt this year! "We believe that everyone is creative. We believe in the power of emotion. We believe that when great minds connect, great things happen" says C2. This is so much in line with my belief and philosophy that I could have written this myself! C2 challenges the Thinking-process by proposing 'out of this world environments'. Being in an unusual place helps digging further into ones thoughts and unlocking the unconscious mind. "Doing the same thing over and over again and expecting different results" was already the definition of insanity by Albert Einstein! This is the thought that inspired me to -for example- deal with the Lego Serious Play methodology in my workshops and coachings and the thought that made me accept C2's exceptional offer! Group Discussion in a pitch black room? => C2 In the Dark Lab - Trending now! What current trends are driving permanent shifts in our industry? Inspire your creative mind by challenging your senses! 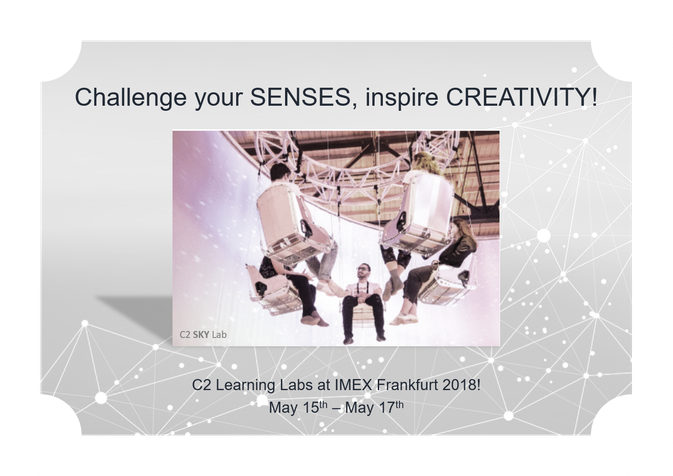 Be part of the C2 lab-experience and meet me at the C2 Learning Labs in the educational and networking event area of the IMEX exhibition in Frankfurt from May 15th to May 17th 2018.